International Trade and Industry deputy minister Datuk Seri Ong Ka Chuan said Malaysia has the potential to become a major global halal hub that Japan could provide investment and technological support for. “Japanese investors continue to show interest in investing in Malaysia. 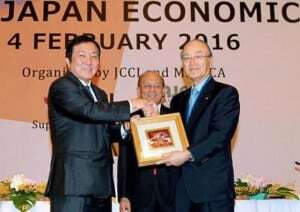 For the first nine months of 2015, we approved 52 manufacturing projects from Japan worth more than RM2.9 billion (S$984 million),” he said when opening the Malaysia-Japan Econo­mic Forum here yesterday. Ong said the formation of the ASEAN Economic Community and signing of the Trans Pacific Partnership Agreement would further establish Malaysia as a gateway to a widerglobal market. Representatives from 80 Japanese and Malaysian companies are participating in the forum which is highlighting the halal industry’s food chain supply and use of efficient and renewable energy. Ong noted that Japan was Malaysia’s third largest trading partner after China and Singapore with a total trade value of RM174.3 billion in 2014. As at the end of 2014, he said there were 2,551 manufacturing projects with Japanese investment totalling RM98.4 billion. Malaysia-Japan Economic Association president Tan Sri Azman Hashim said the forum provides the best platform for companies from both nations to explore possible business ventures in the halal industry. “We are a recognised Muslim country and our halal certification and partnerships will help us produce quality halal products for the global market,” he said. He noted that Japanese manufacturing and logistic technology could further help develop the halal industry here. Malaysia is the leading global halal hub with an annual export value of RM35.4 billion for halal products, representing 5.1% of the total exports for the country.